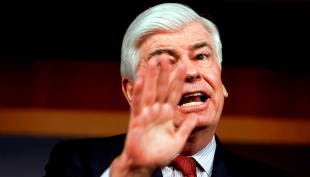 Senator Chris Dodd unveiled his financial reform proposal today – alone. No one else would stand with him at the podium to announce it. The proposal is deeply unpopular with all Republicans, who favor laissez-faire economics, despite the historical evidence that such policy is absolutely devastating to the country. They're not much on history, Republicans. Dodd can probably expect zero support from them on his bill. On the other side, the bill is not popular with Democrats either, at least the radical left wing. They favor iron-fisted, almost Stalinistic government control of every aspect of the economy, an approach that is not only impractical, but dangerously disruptive and historically destructive. For example, many Democrats would like to expand again the size of government bureaucracy to create a consumer financial protection agency. That is the Nanny Government at its worst. Caveat emptor is a better policy. How about we take all the money we would have spend on administering a new government agency, and instead spend that amount on financial education for high school students? It is a down-the-middle approach that will curtail some of the most egregious financial offenses without trying to remodel the entire financial system. In that it is reasonable, moderate, and safe. Whether he can get it passed is a whole different question. There is no middle ground any more in American politics.